Whe n a single tooth is lost, other teeth surrounding it may begin to shift, resulting in an unsightly appearance. In the past, bridges were the preferred method of cosmetic restoration, but surrounding teeth had to be damaged in order to support the prosthesis. As an alternative, many patients seek dental implants as a means of improving cosmetic appearance following the loss of a tooth. 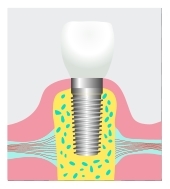 A dental implant has the look, feel and function of a natural tooth, and it’s positioning within the bone where the prior tooth was once rooted prevents other teeth from shifting out of place. The result is a visually appealing smile the wearer can be proud of.